As the earth takes another trip around the sun in 2019, there are a few things that are certain. Life changes (graduation, marriage, babies and aging populations) will happen. And each time they do, people make live-changing decisions, including one of the biggest changes – moving into a new home. While the pundits are all over the map on what the market will be like in 2019 due to new tax changes and interest rates, if you’re selling your home this year, it’s critical to make your home stand out from the crowd. 1) Remember the “Ds” – depersonalize and declutter. If you’ve adopted the Condo method of decluttering, you’re well on your way to a cleaner home. But, if you’re like most people, you have personal items scattered throughout your home. You want people to be able to imagine themselves in this space, so it’s time to put away all the family photos, knick-knacks and items that are taking up valuable real estate. If you have a TV Lift Cabinet, it’s easy to stash all the electronic gadgets and games (along with your flat screen television). Check it out if you don’t have one. 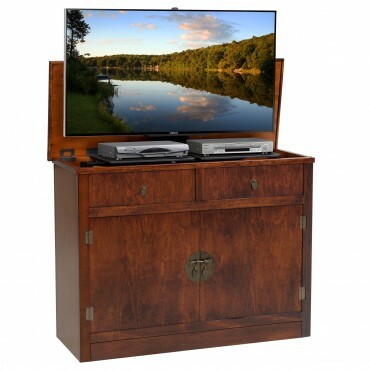 It’s the perfect way to have all your entertainment items in one place – accessible when you want them – and when you don’t want anything out in the open. 2) Consider renting a storage unit while your house is on the market. Less is more when you’re trying to sell your home. In addition to remembering the “Ds” – remove all unnecessary furnishings, rarely used kitchen gadgets, totes full of clothes, etc. If people see lots of piles and totes, they’ll think there isn’t enough storage for their things and move to the next house on their list. 3) Clean out your closets and pantry. People will open doors and cabinets. Stashing items in closets isn’t an option when people are walking through your home. They will look in every nook and cranny. If you don’t need something, get rid of it or put it in storage. 4) Make your house shine. Wash those windows. Vacuum or wash the floors. Dust every item that needs dusting. Place fresh flowers around your home. Bake some cookies. Every little thing matters when you’re trying to sell your home.